Standard Size piston set for the 1928-34 4-cylinder engine. These are the 3 ring type (Rings not included). Come in sets of 4 that are boxed and weight matched! Come with end lock style pins. Aluminum for snap & power! Excellent quality pistons manufactured by an OEM manufacturer! Standard bore size is 3.875"
Note: Not for the small British 14.9hp engine. 0.020 Oversize piston set for the 1928-34 4-cylinder engine. 0.030 Oversize piston set for the 1928-34 4-cylinder engine. 0.040 Oversize piston set for the 1928-34 4-cylinder engine. 0.060 Oversize piston set for the 1928-34 4-cylinder engine. 0.080 Oversize piston set for the 1928-34 4-cylinder engine. 0.100 Oversize piston set for the 1928-34 4-cylinder engine. 0.125 Oversize piston set for the 1928-34 4-cylinder engine. Standard size piston ring set for the 1928-34 4-cyinder 24hp engine. These are for the 3-ring type piston. Full set for four pistons. Made in USA. (Not for the small British 14.9hp engine). 0.020 Oversize piston ring set for the 1928-34 4-cyinder 24hp engine. These are for the 3-ring type piston. 0.030 Oversize piston ring set for the 1928-34 4-cyinder 24hp engine. These are for the 3-ring type piston. 0.040 Oversize piston ring set for the 1928-34 4-cyinder 24hp engine. These are for the 3-ring type piston. 0.060 Oversize piston ring set for the 1928-34 4-cyinder 24hp engine. These are for the 3-ring type piston. 0.080 Oversize piston ring set for the 1928-34 4-cyinder 24hp engine. These are for the 3-ring type piston. 0.100 Oversize piston ring set for the 1928-34 4-cyinder 24hp engine. These are for the 3-ring type piston. 0.125 Oversize piston ring set for the 1928-34 4-cyinder 24hp engine. These are for the 3-ring type piston. Connecting rod nut set for the 1928-31 Model A Ford. These are the castle nuts needed to hold the rod cap to the rod. Set of 8. Con Rod bushing for the 1928-34 Model A and B engine. One bushing is required per connectiong rod. These are for the end lock style pistons. Made in USA. Connecting Rod shims 1928-34. A set of 8 laminated shims for all four rods. Just peel off a layer for adjustment. 0.030 thick. Made in USA. Say "goodbye" to adjusting the clearance with shims by using these new Ford Model A connecting rods with superior lubrication, reduced friction and longer bearing life. Forged using high tensile strength SAE 4140 chrome moly hardened and tempered steel, these rods have wrist pin bushing pressed in, oil holes drilled, and rough bored. Rods are sold without the insert bearings, so please order the needed size of bearings in addition to the rods. 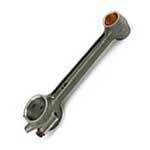 These Model A connecting rods are made to accept the A-6204 style of insert bearings that wrap around the edges. Set of 4, weight matched rods. If you have purchased a set of our new forged connecting rods made for insert bearings, these special bolts hold the cap in place. These fit the style of rods that have the inserts that wrap around the edges of the rod. New rods will already have these included. Once torqued, they will stretch and should not be reused. Solid individually. 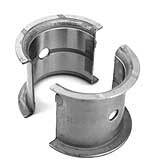 STD Bearing Set designed exclusively to be used with our A-6201 forged connecting rods. Not just an over the counter insert, these are made specifically for the Model A. They wrap around the edges of the rod to provide forward and backward thrust just like the original babbited connecting rod! A set is enough inserts for 4 connecting rods. These inserts fit the connecting rods that measure 1-1/2" wide at the crankshaft journal. .010 Undersize Bearing Set designed exclusively to be used with our A-6201 forged connecting rods. Not just an over the counter insert, these are made specifically for the Model A. They wrap around the edges of the rod to provide forward and backward thrust just like the original babbited connecting rod! A set is enough inserts for 4 connecting rods. These inserts fit the connecting rods that measure 1-1/2" wide at the crankshaft journal. .020 Undersize Bearing Set designed exclusively to be used with our A-6201 forged connecting rods. Not just an over the counter insert, these are made specifically for the Model A. They wrap around the edges of the rod to provide forward and backward thrust just like the original babbited connecting rod! A set is enough inserts for 4 connecting rods. These inserts fit the connecting rods that measure 1-1/2" wide at the crankshaft journal. .030 Undersize Bearing Set designed exclusively to be used with our A-6201 forged connecting rods. Not just an over the counter insert, these are made specifically for the Model A. They wrap around the edges of the rod to provide forward and backward thrust just like the original babbited connecting rod! A set is enough inserts for 4 connecting rods. These inserts fit the connecting rods that measure 1-1/2" wide at the crankshaft journal. .040 Undersize Bearing Set designed exclusively to be used with our A-6201 forged connecting rods. Not just an over the counter insert, these are made specifically for the Model A. They wrap around the edges of the rod to provide forward and backward thrust just like the original babbited connecting rod! A set is enough inserts for 4 connecting rods. These inserts fit the connecting rods that measure 1-1/2" wide at the crankshaft journal. Inserted connecting rods Standard size to fit the A-6303 Burlington Counterbalanced crankshaft. 1928-31. Forged from 1541 alloy steel and stress relieved. Rods come complete with bearings, pin fitted, aligned and static balanced. New, so no core is required. Set of 4. Made in USA. Standard set of new forged connecting rods with insert bearings for the 1932-34 Model B engine. These rods are made to accept the original style wrist pins. Sold in sets of 4 with bearings. Made in U.S.A.
Set of .010 new forged connecting rods with insert bearings for the 1932-34 Model B engine. Set of .020 new forged connecting rods with insert bearings for the 1932-34 Model B engine. Set of .030 new forged connecting rods with insert bearings for the 1932-34 Model B engine. Set of .040 new forged connecting rods with insert bearings for the 1932-34 Model B engine. Set of STD insert rod bearings Designed to fit our new 1932-34 "B" style connecting rods, these are the replacement bearing kits that fit them. A set is enough to do 4 rods. NOTE: Can be used with original rods. If boring out original rods to accept these bearings, the bore specification is 2.0210/2.0215". Made in U.S.A.
Set of .010 insert rod bearings Designed to fit our new 1932-34 "B" style connecting rods. Set of .020 insert rod bearings Designed to fit our new 1932-34 "B" style connecting rods. Set of .030 insert rod bearings Designed to fit our new 1932-34 "B" style connecting rods.